You might've heard that exercising during the evening keeps you from sleeping soundly, but new research suggests that isn't the case. Exercising at night doesn’t have a negative effect on sleep quality, according to a new study. Researchers combed through the literature on the subject and analyzed all 23 studies that met their quality requirements. They conclude that exercising in the four hours before going to bed does not have a negative effect on sleep. Vigorous training within an hour before bedtime is an exception to the rule. 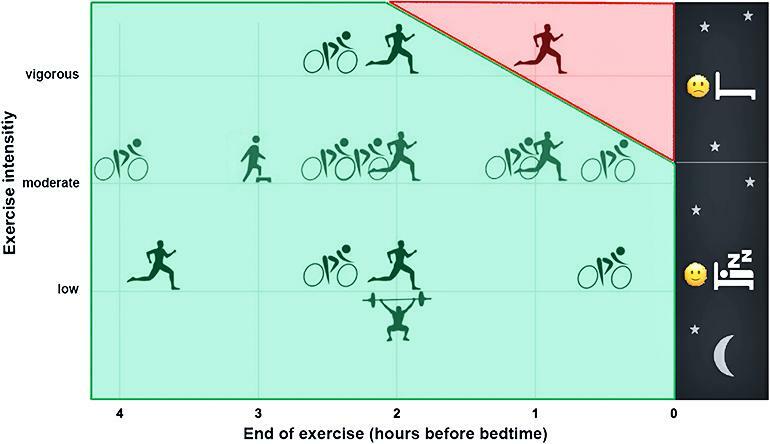 According to this analysis, it is the only type of evening exercise that may have a negative effect on sleep. “However, this preliminary observation is based on just one study,” Spengler says. “As a rule of thumb, vigorous training is defined as training in which a person is unable to talk. Moderate training is physical activity of an intensity high enough that a person would no longer be able to sing, but they could speak,” Spengler says. One example of vigorous training is the kind of high-intensity interval training that competitive athletes often perform. In many cases, though, a longer endurance run or a longer ride on a racing bike would fall into the moderate training category. According to the official recommendations of sport physicians, people should do at least 150 minutes of moderate exercise each week. Many may ask themselves: should I exercise in the evening if I didn’t have time during the day, or will that have a negative effect on my sleep? “People can do exercise in the evening without hesitation. The data shows that moderate exercise in the evening is no problem at all,” says Jan Stutz, a doctoral student in Spengler’s research group and lead author of the analysis. Moderate exercise did not cause sleep problems in any of the studies researchers examined, not even when the training session ended just 30 minutes before bedtime. “However, vigorous training or competitions should be scheduled earlier in the day, if possible,” Stutz says. Stutz and Spengler point out that they examined average values over the course of their analysis, which made only general statements possible. “Not everyone reacts to exercise in the same way, and people should keep listening to their bodies. If they notice they are having problems falling asleep after doing sport, they should try to work out a little earlier,” Stutz says. The research appears in the journal Sports Medicine. The post Exercise at night won’t mess up your sleep appeared first on Futurity.